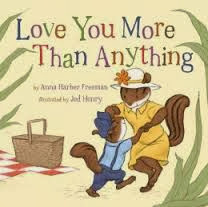 Love You More than Anything is an adorable and sweet picture book that communicates to the child in your life that you well...love them more than anything! After going through a series of delightful and fun things, the author reminds the child they are loved even more than those things. The illustrations are whimsical and darling featuring a family of chipmunks in Autumn. I love this book and think it would be a fantastic read for any parents with small children. I received a review copy from Sterling Publishing.